One Friday in mid-October, around 11:45 p.m., my partner Emily and I had just finished a night of swing dancing with friends in Madison, Wisc. We were sore and sweaty and still a little wired, so sleep wasn’t the most likely option if we went home. We decided to go dumpster diving. On this particular night at a local grocery store, we found bushels of red peppers (wrapped up and still several days from expiration), a bag of about 50 bagels, two giant butternut squashes, and more corn than anyone should ever eat. Aug. 14-15 in Madison is called "Hippie Christmas." It is a time when all the apartment leases in the city are up. Similar to graduation, people throw unwanted goods on the curb. This past summer, Emily and I rented a truck and drove searching around items to sell. We filled it in only a few hours. It started out as a fun and thrifty hobby we could do after talking to a couple who had actually met in a dumpster. And while it is certainly fun, it also became heartbreaking very quickly to see how many perfectly good items — especially food — get thrown out on a daily basis. According to the Food and Agriculture Organization, if food waste were a country, it would be the third largest emitter of carbon dioxide in the world, just behind China and the United States. Based on what I’ve seen in dumpsters — and to know that this is all in just one Midwestern town — that’s not unfathomable: I’ve seen dumpsters full of spaghetti, still steaming from the hot bar it occupied only an hour before. A typical grocery store haul. It is very typical for us to find vegetables still in their packages. Peppers, spinach, bagels, and some cookies for dessert! It’s true! Produce expires pretty quickly. For example, the shelf life for Brussels sprouts is about three to four days if properly refrigerated. That means that they start showing signs of wear in the supermarket in less time. So where is a grocer going to put them if they are technically fine, but no longer attractive enough to sell? The trash, of course! And with any luck, that grocer will dispose of them in a way that makes it safe for me to scoop‘em right out for dinner! I’m not saying this to knock grocers; they provide an invaluable service to their communities. But we in the U.S. do have some issues with unattractive, yet healthy, food. Thankfully, companies like Imperfect Produce exist, which combats food waste by “finding a home for ‘ugly’ produce,” as their website states. That is, they take produce from farms that is perfectly good, but won’t sell in grocery stores due to superficial damage, and they sell it for far less than you’d normally pay! In October of 2018, Emily and I spent a whopping $84 on groceries, all thanks to dumpster diving. The only grocery shopping we’ve actually done is for essentials that we don’t usually find: milk, sugar, salt, flour. Graduation is a busy time for students. Not only are they wrapping up classes, but they're cleaning out apartments. 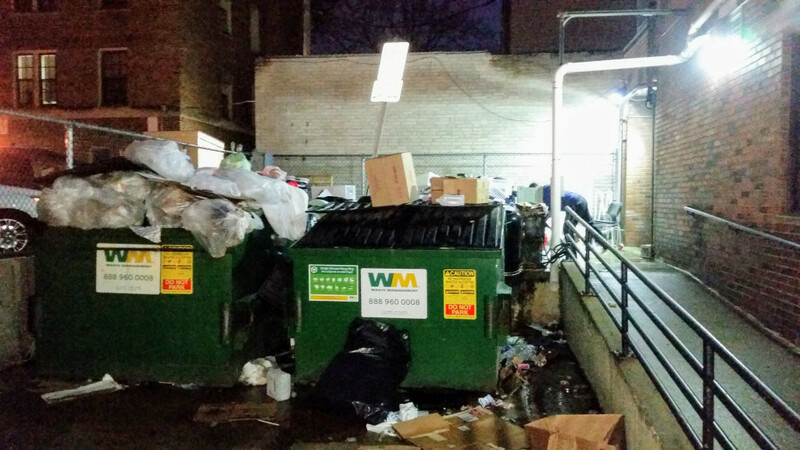 The trash area outside of campus housing contained bags of clothes, furniture, bathroom products, and much more. So many of these items could've been donated. We may not be reducing it by a lot, but it feels like we are. It feels oddly satisfying, like a subversive civic duty, to come home from a 15 minute trek with two giant boxes of food. But it’s also very sad: The U.S. Department of Agriculture in 2014 estimated that 49.1 million Americans were living in food insecure households. Thankfully, there are apps out there that work to curb such waste. Apps like MealConnect act as liaisons among food donors, food pantries, and food insecure households. (Emily and I have discussed starting a similar business.) But while they do exist and do amazing work, nearly half of all food produced still ends up in dumpsters. Emily and I also found this virtually perfect 12-string guitar on Hippie Christmas. Maybe someone got fed up trying to learn "Stairway To Heaven"? As the saying goes: one person's trash is another's treasure. In addition to scrounging for food in dumpsters, Emily and I have been keeping our eyes peeled for what we call “roadside finds” — or large furniture items people leave on their curbs for garbage day. We take these items, spruce them up, and sell them. We’ve made over $1,000 doing this. I’m writing this not to brag (OK, maybe a little), but to highlight that these items we’ve sold may also have ended up in a landfill otherwise. But for less than an hour of work for each sale, we've been able to clean them up and give them happy homes while making a small profit. I'd like to challenge you to keep a look out for perfectly good discarded items in your community. They may not mean anything to the person throwing them away, but that doesn't mean they can't have new life elsewhere. Obviously, dumpster diving is not for everyone. It takes a lot of suspension of disbelief to shove your (hopefully gloved) hand into a pile of trash. Or to not even question what that liquid that just spilled on your arm was. But there are definitely good things that come of it if you can. This hobby has changed my life in many ways, and I hope that after reading this, it might change yours, too.